When you are working on a process of employee engagement, you should look at how metrics for teams — that is, internal business units and/or profit centers — boost engagement. For example, suppose you work for a national retail chain. If you include these types of measurements in a team performance assessment, employees who work at one of your retail stores can see how their store is performing compared to other stores in the chain. This can spark competition between the stores, which drives both engagement and results. This process must be complementary, not destructive. Be sure you strike a balance between promoting internal competition and establishing a “We all work for one company” culture! A great benchmarking tool for this process is the Team/Business Unit Performance Benchmark Matrix (shown in the figure). In this matrix, you can use any two measureable data points as your benchmarks (quality, employee turnover, customer satisfaction scores, shrinkage, and so on). 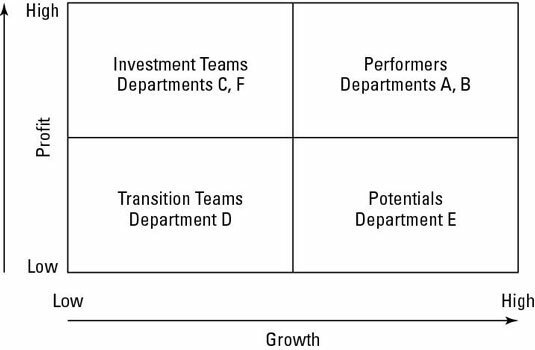 In this matrix, the profit centers are assessed the same way employees are, as investment teams, performers, potentials, and transition teams. Using this matrix, teams and business units can quickly determine whether they’re “losing” to other groups in the organization. Believe me, no team wants to find itself in that bottom-left quadrant. When they do, they’ll become engaged and commit to moving out of the “transition” category! The Team/Business Unit Performance Matrix. Our leadership team makes decisions unselfishly, for the greater good of the company. They don’t make decisions in their own self-interest. Our leadership team is seen by its employees as aligned on mission, strategy, goals, and priorities. They focus and align in one consistent direction and behave in a way that supports this focus. Our leadership team automatically and consistently assumes the best intentions in one another. They don’t assume that others have ulterior motives, especially when they disagree. All team members assume that teammates want what is best for the organization. It’s okay to have different opinions, and the team can engage in an open and respectful discussion. Our leadership team openly discusses issues in meetings. We have open, respectful, yet challenging conversations in meetings. We don’t have contrary discussions in the hallway, after meetings. Team members say what they want in the room, not after the meeting. We avoid “I won’t comment on your sandbox if you don’t comment on mine” behavior. When a decision is made in a meeting, our leadership owns the decision as ours and fully supports it outside the meeting. When decisions are made, our leadership supports them with employees. Employees hear a single voice. Our leadership is acutely aware of the impact of the shadow they cast on our organization. They recognize that employees notice everything they do — from their actions to their words to their moods. They act with the knowledge that others look up to them and emulate their behavior. They’re seen by their employees as being aligned. Our leadership fully participates in initiatives instead of just “blessing” them. Because of the shadow phenomenon, which states that leaders have a tremendous influence on the company environment, leaders support company initiatives. They share in the responsibility, knowing that how we are led determines how we lead. All teams are managed and measured with the same level of accountability. Team members openly admit their weaknesses and mistakes. Team members willingly make sacrifices (such as budget, turf, and head count) in their areas of responsibility for the good of the team. We as individual team members are slow to seek credit for our own contributions but quick to point out those of others. Individual members focus on the needs of the team and not their individual or promotion needs. Consider using a free survey tool, such as SurveyMonkey, to conduct this survey. For best results, individual responses should be kept confidential. Results should be tabulated and used as a benchmark. After results are tabulated, the team should meet to discuss them and identify an action plan for improvement.